We care about the privacy of our customers. Please read our entire Privacy and Security Policy. Is my credit card information kept secure? We have special technology called Secure Socket Layer (SSL) to prevent unauthorized people from intercepting your credit card information. I don't wish to give my credit card information online. Are there other ways to order? Yes. We are here to serve you. If you don't wish to shop online, you may order by phone, fax or email. To order by phone, call toll-free: 1800.659.3358. By fax, just print out your completed shopping cart and checkout pages and fax to: 440-255-6434. By email, just enter the quantity & product SKU number and email to sales@evergreenmidwest.com. For your convenience we accept payment of VISA, MASTERCARD, DISCOVER, AMERICAN EXRESS and PAYPAL . We also accept business and personal checks, but this payment method must be prearranged prior to placing your order and with approved credit application on file. Please contact us for help in prearranging payment by check. Please phone 1800.659.3358. Customers in some states must pay applicable sales tax for certain types of products. Refer to your local sales tax rate as applicable. Sales Tax is charged on shipments to jurisdictions where sales tax is applicable. The taxability of a particular item is determined by the guidelines set forth by the jurisdiction the item is shipped to. Taxes are estimated to the best of our ability, and will be final on your order confirmation. The amount of tax charged is based on current tax rates. Shipping charges may also be subject to tax in applicable states. Tax will be refunded for returned items. IF you are having trouble determining what to order, you may contact our Sales Dept. directly at: 1800.659.3358. Where are your items manufactured? Most all of the products sold at Evergreen Midwest are manufactured in the United States. How can I view the Technical Information for an item? Most of the products on our website have detailed Technical Data Information sheet available. Click on the Data PDF sheet the product information on the product page. If supplement Data Sheets are not available or insufficient, please contact us for more information. I have the catalog item number of the product I'd like to purchase. How do I order it? Click on "Search button," which is located on the upper right-hand side of every page. You'll be linked to a page where the products you want to buy are located. Just enter the quantity and hit “Add to Cart” The rest of the checkout procedure is the same. How do I find information about a product? Click on the "Manufacturers" tab at the top of the Evergreen Midwest website. Here, you'll find a wealth of information about the products we carry. Use our search engine: Located at the top right corner of each page, our search engine is specially designed to let you filter or narrow down your searches based on a variety of criteria. You can search by part number, product type or any keyword you choose. Click on our quick links: Located directly under the "Categories" headline on the upper left hand portion of your screen, our quick links help you find what you need in a flash. A product I wish to buy is out of stock. Can I still order it? Yes. We would suggest that you phone us at 1800.659.3358. We will be very happy to help you. I am not a supplier, can I still buy from you? Yes. We are primarily a source for the commercial industrial gas customer but we welcome your business! We have succeeded in business for over 35 years because we do everything we can to treat our customers as we ourselves would like to be treated. Therefore, we are very liberal in our return policy. Please contact us at 1800.659.3358 or sales@evergreenmidwest.com and we can provide a return material authorization number (RMA). If the returned item is in new, unused condition we will authorize a refund. A reasonable handling charge will be assessed for all special order items or items that have been used. I ordered the wrong item, how do I return it? Contact Customer Service at 1800.659.3358 to receive an authorization number from us. Once the item is received, we will process your new order, apply any necessary credits or charges, and ship the exchanged item to you. My equipment is malfunctioning, how do I use the product warranty? Contact Customer Service at 1800.659.3358 for assistance in locating an authorized service agent in your area or a replacement item. I changed my mind, how do I cancel my order? Orders that have not been shipped can be cancelled by contacting Customer Service at 1800.659.3358 immediately, either by phone or email at sales@evergreenmidwest.com. If your order has already shipped and you still wish to cancel your order, you will be responsible for all round trip shipping charges. If your order already shipped, simply refuse it when it arrives or send it back at your cost and we will credit you for the order less the applicable shipping charges. What should I do if the order arrived and there is visible damage to the package? Be sure to note any damage or suspect areas of the shipment with the delivery person prior to signing and accepting the delivery. Contact Customer Service at 1800.659.3358 immediately if you are unsure of whether you should accept the shipment or not. You do have the right to refuse receipt of a shipment if the damage is obvious. Please note any damage on the delivery bill. I'm missing an item from my order. What do I do? If an item has is missing from your order, please check your packing slip to ensure that missing item is not on backorder. Check your email confirmation for possible multiple tracking numbers. Please feel free to phone us at 1800.659.3358 or email; sales@evergreenmidwest.com. Every effort is made to ensure that the items on our website are in our warehouse. However, there will be times when an item is on back order. If the item that you ordered is on back order you will be notified immediately by email and given the option to cancel your order. If you would like to confirm available stock please call us at 1800.659.3358 or email sales@evergreenmidwest.com. Our corporate offices and main warehouse are located at 8976 Osborne Drive, Mentor, Ohio. Can I get my purchase shipped to me? Yes, we ship to all 50 states and to the Canada. After placing your order, a shipping quote will be emailed to you for your approval. How is the shipping calculated? Rates for UPS are calculated automatically based on the current published rate. 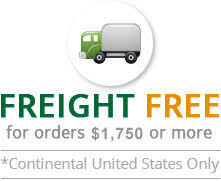 Rates for LTLK shipments are quoted by three carriers and we choose the most economical. What does standard shipping mean? Standard shipping covers the shipment from our loading dock to your desired shipping address, insured for the cost of the order. UPS shipments are delivered to either the front door or reception area, if available. Larger shipments, that are shipped by common carrier, will be delivered to your loading dock and will require a signature by the receiving personnel. If a loading dock is not available, the delivery will be made curbside, which means that the driver is only responsible for getting the shipment to the end of the driveway at your location, leaving you responsible for unloading, unpacking and taking the merchandise indoors. Please be aware the shipping costs do not include a lift gate. If you do not have a loading dock, we highly recommend purchasing additional lift gate service, especially for heavy and/or bulky items. Can I have a shipment sent C.O.D.? No, we do not ship any orders C.O.D. (Cash On Delivery). All orders must be paid in full prior to shipment. Do you ship outside of the U.S.? Yes, we will ship all over the world. International shipping rates are determined by a variety of factors, including but not limited to: weight, dimensions, number of boxes, destination, fees and tariffs and desired transit time. Please contact Customer Service at 1800.659.3358 for assistance in determining the best shipping method to your destination. Can I pick my order up at your warehouse? Yes. Our main warehouse is located at 8976 Osborne Drive, Mentor Ohio 44060. Hours of operation are: 8:00 am – 4:30 pm EST. You would need to phone Customer Service at 1800.659.3358 to complete your order and schedule your pick up. We were founded on January 3, 1978. Evergreen Midwest started in Cleveland, Ohio and we have been in our current facility for over 14 years.